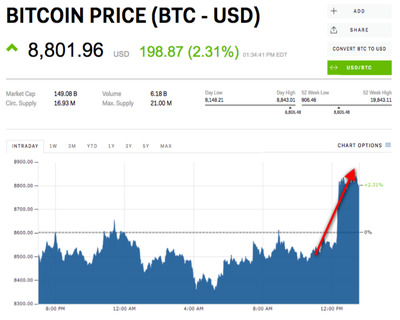 Cryptocurrency markets continued to push higher following reports from a G20 summit in Argentina that financial leaders from the 20 largest economies showed no sign that they would make moves to clamp down on the nascent market. The price of bitcoin, the largest crytocurrency by market capitalisation, jumped during Tuesday’s trade from around $US8,500 to over $US8,800 a coin, according to Markets Insider data. That’s its highest point since last Wednesday.